Plagued with guilt about contributing to global warming every time you drive the gas guzzling big car or let the air-conditioning go full blast? Now, there is a way to reduce the guilt. Carbonyatra.com, India’s first carbon market information portal and a consulting firm, says it has come up with a plan to sell carbon offsets to individuals. Now, you can have a carbon-neutral wedding, a carbon-neutral flight (a major emitter of greenhouse gases), zero-carbon birthdays and simply provide feel-good gifts that try to do their share in reducing global warming. So, the idea is to pay for emission reductions elsewhere instead of trying to reduce your own emissions. 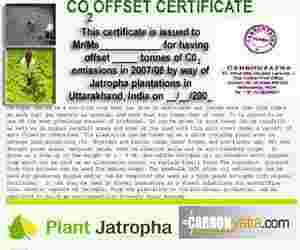 The reduction certificate you buy from Carbonyatra.com will be invested in jatropha plantations in Uttarakhand. Once these offsets are paid for, a certificate will be sent to the buyer and there will be a plant to your name. “Our project partners are setting up cooperatives with the farmers for the jatropha plantation on their fallow land. The cooperative will allow small farmers to participate as well," says Rosanne Rodricks, managing editor, Carbonyatra.com. The company, meanwhile, is also looking for other renewable energy projects around the country to invest in, especially biogas projects. It won’t come cheap though. A family that drives two medium-sized petrol cars and uses approximately 850kWh of electricity a month, will have to spend Rs5,500 to offset their carbon emissions for a year. A carbon calculator, which uses emission factors based on the stringent UK department for environment, food and rural affairs, or Defra, standards issued this year (also available at www.carbonyatra.com), allows users to calculate their carbon footprint in very simple ways—from the extent of their use of home energy, cars, bikes, buses, trains, air travel and other energy burners. “Though it is a big hit in Europe and the US, there is a lot of scope for fly-by-night operators," warns R.K. Pachauri, chairman, Intergovernmental Panel on Climate Change and director general, The Energy and Resources Institute. “The problem is, where is the guarantee that your money is being used in the appropriate projects?" he asks. Carbonyatra.com’s editor-in-chief Kishore Butani says that his company will be responsible for making sure the money is being spent responsibly and will not only send photographs as proof, but would also welcome their customers to visit the plantation site. A few individuals in Europe, the US and Australia have been voluntarily offsetting carbon emissions through such schemes though international prices for such feel-good certificates are much higher—almost four times more than what Carbonyatra.com is proposing to charge. Several companies, too, are voluntarily buying carbon offsets from other companies such as Be Green or the CarbonNeutral Co.
Indian companies have to go to foreign companies to buy carbon offsets, which are invested in foreign projects, notes Butani. “Why should they or you have to invest somewhere else, when we can do it here?" Environmental consultant Kiran Patil, for one, says it is an idea whose time has come. “I wanted to gift carbon offsets to my daughter and am definitely going to buy these," she says. “It is a good idea if I can help reduce the climate change load."